The National Weather Service office in San Diego is forecasting a return of hot weather and elevated fire danger this weekend. The weather service said a high pressure system will warm up Southern California starting Friday and continuing through Sunday. Saturday will be the hottest day, with temperatures 5 to 10 degrees above normal. 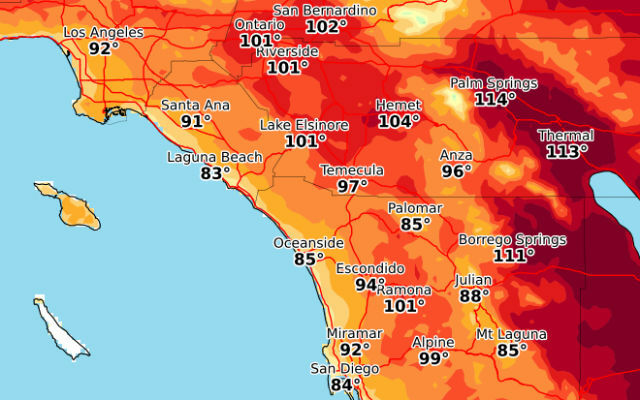 Ramona could see a high above 100, and it could hit 111 in Borrego Springs. With low humidity and gusty winds, the weather service also warned of fire danger during the three days of excessive heat.